Set on an adventure with your squad to explore the ruins of the ancient Kondaveedu Fort, near Guntur. Not only will you be able to bask in the history, but also trek amidst the greenery and serene environment. Constructed by the Reddy kings in 14th century, Kondaveedu Fort is scenic even though in ruins, today. Upon an oval hill, in the middle of a reserve forest, this fort is not an isolated structure, but has the company of two other unnamed forts. Most people prefer to go here on a picnic, as the atmosphere is ideal with peaceful surroundings that you can get to after driving along the ghat roads. The small hike in the forest to get to the main entrance of the fort is quite breath-taking. There are ramparts, granaries, wells and humongous stone walls to explore. The view from top of the hill, too is one to remember. 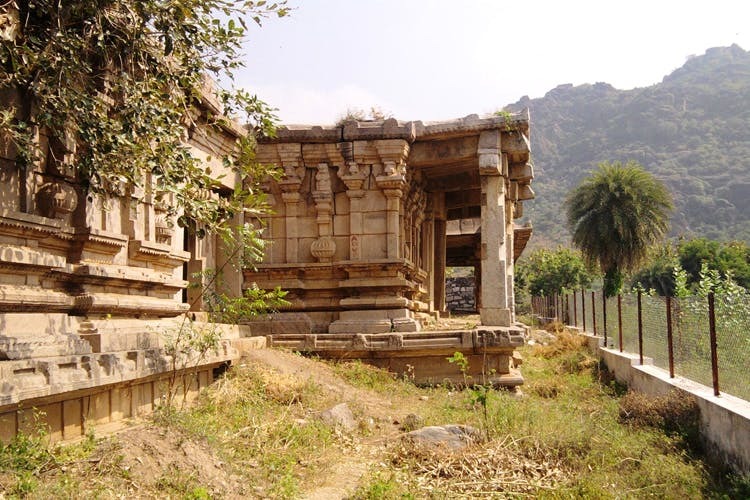 You get to see the whole of Guntur city with all its temples, ponds, and landscapes. At the foothills, you can witness the Gopinathaswami Temple which has many pillars carved out of a single rock. There is also a mosque inside the fort. So, the next time you and squad want to go on a drive not too far from the city, head to Kondaveedu to get the best of history, leisure, and adventure. Although the roads have been maintained, there are not many options for food and drinks around the fort. Since it is hardly a five and half hour drive from Hyderabad, we would recommend going here for a picnic and returning on the same day. However, if you want to crash for the night, put up in any hotel in Guntur.